Silver prices in India have been relatively stable for the last two years, but are about half their 2011 peak. India last month started distributing the first installment of 2,000 rupees ($29) to smallholders, under a program that proposes to spend 750 billion rupees in the year beginning April. “The government cash handouts to farmers will help silver demand much more than gold,” as many recipients only have the purchasing power to buy the cheaper metal, said Sheth. Silver prices in India have been relatively stable for the last two years, and are about half their 2011 peak. At around 38,000 rupees a kilogram, the metal is about eighty times cheaper than gold and a far more affordable investment or gift for the average citizen. 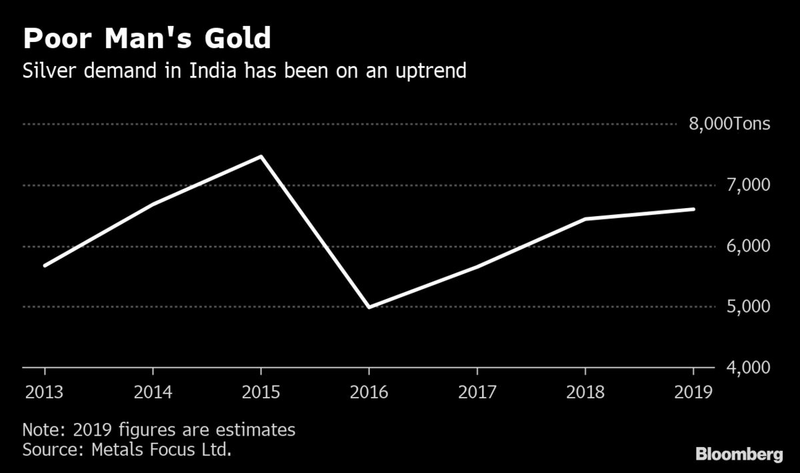 In contrast to gold imports, which collapsed last year, inflows of silver rose 36 percent in 2018 to 6,958 tons, just shy of the all-time high of 7,579 tons seen in 2015, according to India’s trade ministry. Sheth pegged this year’s imports at between 6,000 tons and 7,000 tons.